Sonic is back in the Macy's Thanksgiving Day Parade this year. Let's hope he has a better time of it than in 1993, when he was blown into a lamppost and popped. Not that I'm insinuating you should pull anything mischievous in our latest 'Shop Contest. 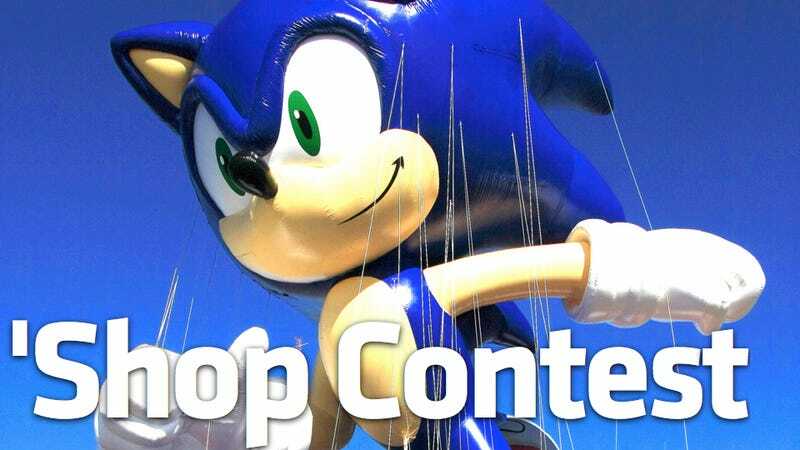 You may recall that 1993 was not only the year of Sonic's ill-fated encounter with a streetlamp; it was also his debut year in the parade and also the first year any video game character appeared as a balloon in the Macy's parade. Those facts, the upcoming parade, and Sonic's 20th anniversary year make this a timely contest, even if the image we've got doesn't seem particularly exploitable. Source Image: Sonic the Hedgehog the Balloon Test Flight. What can you do with that? You're a creative team. You can put him over a different landscape, swap heads with another character, make a callback to another 'Shop Contest, etc. In other words, the usual stuff you come up with to make this such a popular weekend feature. Just no Amy Rose Rule 34 like Fahey dumped on me when I complained about her challenge stage in Sonic Generations. Remember, I do take suggestions for future 'Shop Contests. So if you've got one, by all means shoot me an email.